In this piece I set myself the challenge of trying to use as much recycled material as possible in creative ways. The squares which formed the background were found under our old bed when a new bed was being delivered. I believe that they were cut in a Gloria Laughman class to create a “glowing” background. I blew the dust off them, and arranged them to form a gradated background, to represent the dark era we may descend into, if we do not take care of the earth. Each of the arrows was created from different recycled material. One arrow is made from shavings from a rug-making training facility in Kusadasi, Turkey. We were touring the facility so I casually asked what they did with the pieces of yarn which are trimmed off after the knotting of each row. I was told that they threw them out….so I asked if I could have some! These silk and wool snippets were needle felted to create a new fabric. Another is made from a remnant from a bag of off-cuts that Robert Talbot, a well-known California tie manufacturer sells to fibre artists. The third one was made from Tyvek rescued from a used US Postal Service Priority Mail envelope. The central graphic is courtesy of freepik.com. The batting is a piece of Quilters’ Dream Green batting made from 100% recycled plastic bottles gifted to me by one of my students from her project. 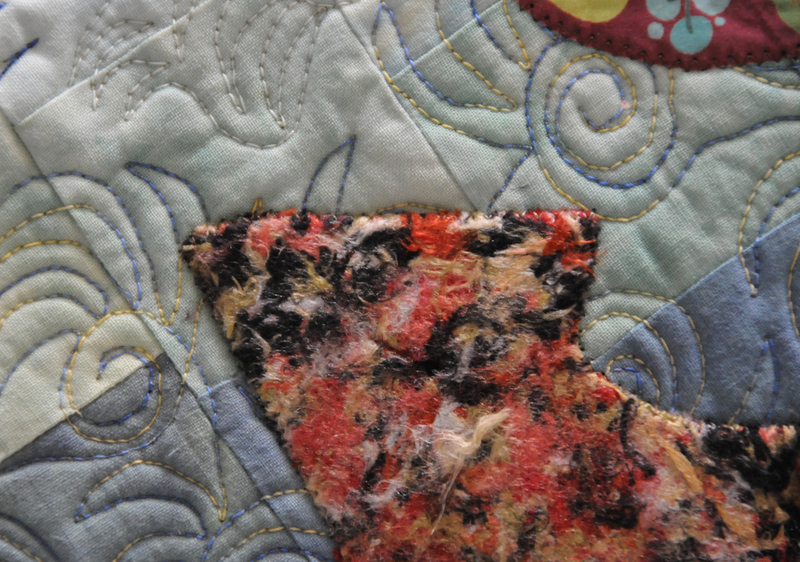 Techniques : machine piecing, needle felting, applique, and quilting; photo transfer onto fabric. Materials: Cotton and silk fabrics, Tyvek, silk and wool fibres, cotton threads, batting from recycled plastic bottles, and acrylic paints. An interesting piece using so many different materials. Great idea to use recycled batting! Very nice way of using so many different recycled materials. 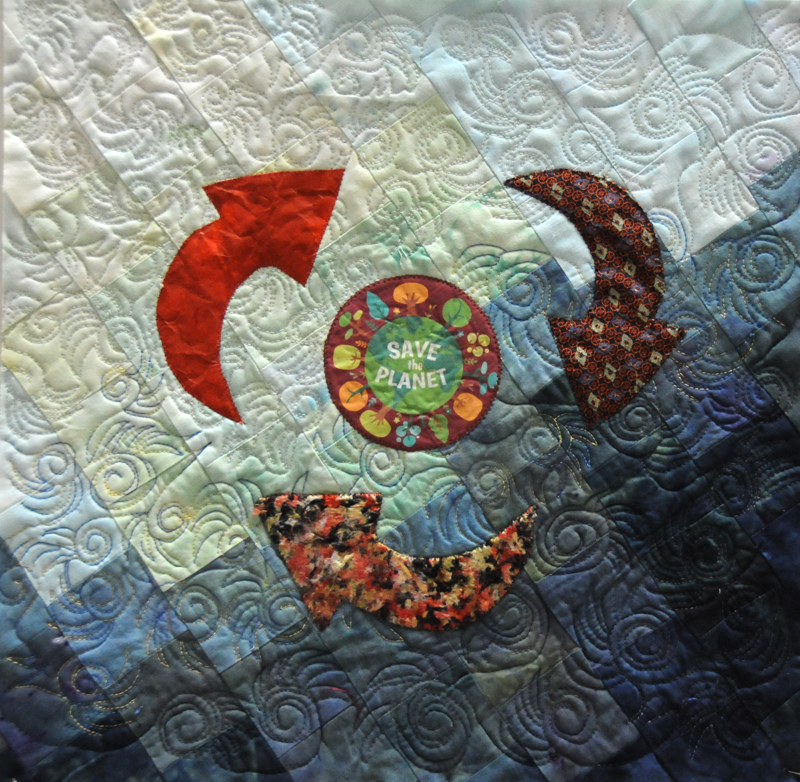 Love your free motion quilting. I love your quilting. They are beautiful! Good choice of materials. Thank you—arranging the fabrics to get the effect I wanted was quite a challenge.